Route: Middlesbrough - Buenos Aries. SS Chaucer a 5.790-ton British freighter, in ballast en route to Buenos Aires on July 29, nearly eight months since raider Orion last success. Chaucer was intercepted about 860 miles west of the Cape Verde Islands. 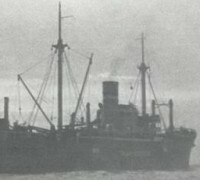 At first Kapitän zur See Kurt Weyher was unable to identify the ship, but when the sun went down the ship remained blacked out, a sure indication that it was an Allied vessel. At first, the freighter ignored the Orion’s warnings, but then began to send sending distress signals saying she was being attacked, opening fire with her 40 mm Bofors gun as the raider approached, doing some minor damage. Her 48-man crew finally abandoned their sinking ship, 18 of them wounded, and were taken on board. It took several torpedoes and over 400 rounds of 150 mm ammunition to sink her. All forty-eight men got off the ship in lifeboats and tried to disappear into the darkness, however the crew of Orion was able to round all of them up and take them prisoner. The ship was then sunk using torpedoes and gunfire. The crew of Chaucer were taken to Milag Nord PoW camp where all but a few remained until the war was over.